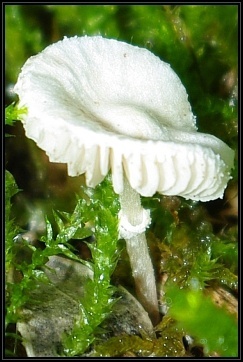 Description: Solitary to scattered, delicate amongst moss near Laurus nobilis and Pistaccia sp. Pileus: Light yellowish brown coloured, convex to flat with central umbo, smooth, dry, very delicate (flimsy), 7-13mm in diameter. Stipe: Thin, hollow and very fragile, with fragile descending ring, straight, almost white, pruinose near cap area. 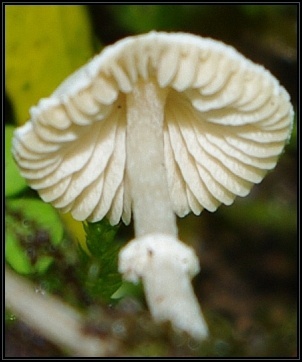 Gills: Free, close, almost white, L=21, l=1-3. 10% Ammonia: Gills - colour change to green. Basidia: 2-, 3- and 4-spored, with uneven distribution (4-spored middle of gill, 2-spored inner part of gill). 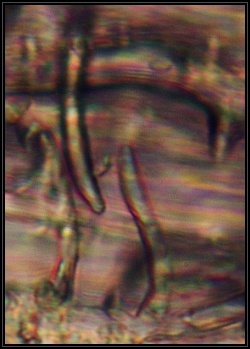 Stipitipellis: Filamentous with hyphal ends protruding vertically sometimes splitting into two. 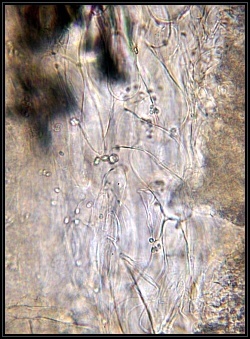 Gill trama: Irregular with large inflated sausage-shaped hyphae. 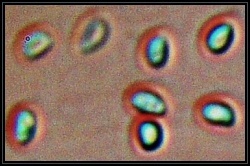 Spores: Ellipsoid, small, hyaline without germ pore, smooth, inamyloid. 3.6-4.3µm x 2.3-3.2µm width, Q: 1.21-1.61, Qm=1.44.